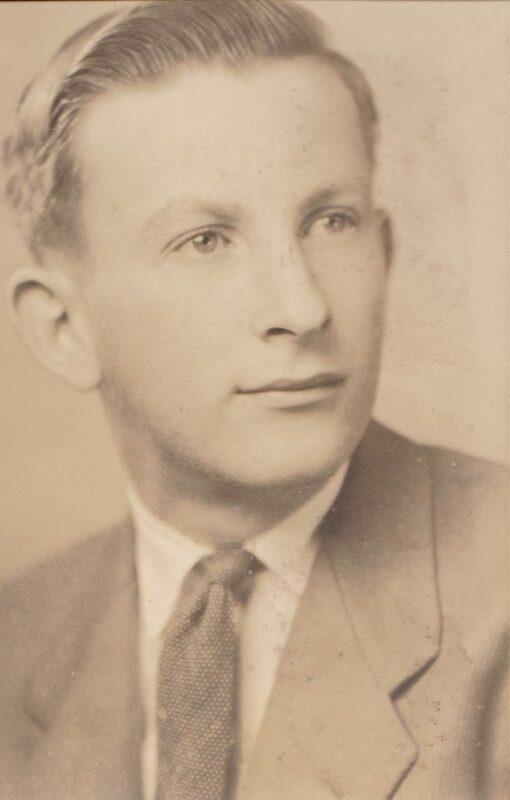 Frank Wetzel’s journalism career began while he was a soldier at the end of World War II. The Bremerton native, whose illustrious journalism career included writing the preeminent history of the city’s World War II era, penned an article describing the horrors of the Holocaust. 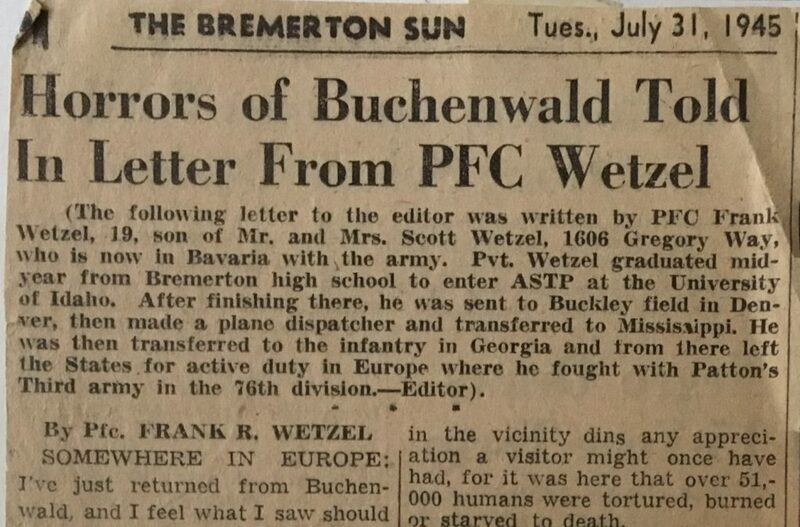 In Sunday’s Kitsap Sun, I chronicle Wetzel’s life from a teen to his penning “Victory Gardens and Barrage Balloons.” HIs first byline? The July 31, 1945 edition of the Bremerton Sun. The topic? Wetzel’s impressions of the Buchenwald concentration camp. The thing that impresses me most is the maturity of his writing. We’re often told journalists write the first draft of history, but Wetzel’s story here, documenting the tragedies of the Nazi death camps, feels like it could have been written yesterday. SOMEWHERE IN EUROPE — I just returned from Buchenwald and I feel what I saw should be common knowledge to every citizen of the U.S. in order to more fully understand the cruel and sadistic nature of our recently defeated enemies. This is not the work of just a handful of men— every German condoned with his silence this project of mass butchery, and is, in part, responsible. Buchenwald is small — only about the size of two city blocks — yet the suffering that took place there is indescribable in its scale and intensity. It is located near the city of Weimar, in a part of the most beautiful sector of Germany, but the spector of death hovering in the vicinity dins any appreciation a visitor might once have had, for it is here that over 51,000 humans were tortured, burned or starved to death. A German-Jewish guide, formerly a prisoner in the camp, met us at the gate and volunteered to show us around. Three months of good food had erased all outward signs of malnutrition, but his broken English was made harder to understand by the loss of most of his front teeth, knocked out for a minor infraction of rules by an SS guard. Our first stop was at one of the barracks, typical of the camp. It was a one-storied wooden building about 200 feet long. Along each side were bare shelves, starting with the floor and reaching the roof. These were beds. An indication of the living (?) conditions is the fact that between 700 and 900 men were crowded into these structures. The one meal per day, consisting of thin soup and bread, was not only insufficient in bulk but gave many diarrhea. The woeful lack of sanitation facilities made long lines throughout the day and night inevitable. Perhaps the grimmest part of Buchenwald was the eight ovens used for burning the dead. By stuffing two bodies in each oven, 32 could be cremated per hour — even so, the Germans had to work day and night to dispose of the dead. The ashes were irregularly collected and used for fertilizer. Evidently proud of his work, the manufacturer had his name stamped on each oven. I’m sure that none of the inmates would recommend them for him, however. I could go on — tell you about the SS men who took their children on a tour of the camp for being good, or the pitiful scratches in the concrete walls, made when prisoners were being strangled, or even about Herman Pister, the “beast of Buchenwald,” who personally murdered 2800 human beings whose only crime was the courage to cry out against the outrages of the Third Reich. But why go on? For Buchenwald is beyond description. The only way to fully believe it is to see it.